On 14 December 1932, the memorandum of association of the “Luxembourg Federation of Catholic Charites” (Katholischer Luxemburger Caritasverband) was signed, thereby uniting lay charities that were firmly rooted in Catholic associations in Luxembourg. Over the years, Caritas has developed its action on behalf of and with children, families, the elderly, migrants, refugees and the rootless. The international dimension was confirmed after 1949 with the establishment of Caritas Internationalis, of which Caritas Luxembourg was a founding member. The Luxembourg member of Caritas Internationalis is now a confederation, the “Confédération luxembourgeoise d’œuvres catholiques de charité et de solidarité, association sans but lucratif”, for short the “Confédération Caritas Luxembourg a.s.b.l.”, which currently includes 18 members active in such areas as assistance to children, young people and families, assistance to refugees and migrants, to drug addicts, the homeless, the disabled, the elderly, the sick, the unemployed, etc., as well as international aid. 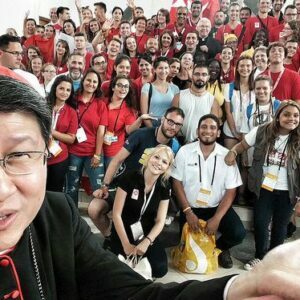 The Confederation aims to support and advise its members on theological matters, especially the social teaching of the Church regarding ethical and moral questions, as well as dialogue with its members on important social issues. Three members of the Confederation, namely the Fondation Caritas Luxembourg, Caritas Jeunes et Familles asbl and Caritas Accueil et Solidarité asbl, collaborate more closely under the common name of “Caritas Luxembourg“. Caritas Luxembourg’s engagement around the world (in more than 20 countries) currently involves supporting local partners in their fight against injustice, destitution and poverty. Caritas works alongside the victims of natural disasters and violent conflicts, and seeks to open up paths to justice, peace and reconciliation. In certain contexts, via its offices on the ground, Caritas Luxembourg implements long-term programmes, primarily in the Balkans, the Horn of Africa, Laos and Tajikistan. Caritas Luxembourg’s responses include humanitarian aid and emergency relief, followed by rehabilitation and reconstruction assistance, then development cooperation.